A pale, ghostly shape floats over a New Forest heath, skimming the top of the dark, winter heather in a determined search for the few small birds and mammals concealed below. It is a hen harrier, a subtly marked, light-grey male, a large bird of prey and one of the New Forest’s most striking winter visitors. William Turner, writing 460 years, or so, ago, said: ‘It gets this name amongst our countrymen from butchering their fowls’, although that now is somewhat difficult to imagine. The hen harrier’s breeding grounds are in Britain’s uplands - on the moorlands and mountains of northern England, Scotland, Wales, Northern Ireland and the Isle of Man. Hen Harriers are specially protected by legislation, but in these remote places, even now, some of these magnificent creatures are illegally trapped, shot and poisoned on the grouse moors - they are killed to prevent red grouse predation, killed so that men can then kill other birds for sport! Indeed, the hen harrier is often considered to be England's most threatened bird of prey. No youngsters fledged at all in 2013, for example, although BirdGuides reported better news for 2015 (under the banner 'Hen Harriers have most successful English breeding season for five years') saying: 'Despite poor weather throughout the breeding season, there were six successful Hen Harrier nests this year, fledging 18 new chicks. An additional seventh nest which was close to fledging young unfortunately failed late in the season, due to natural predation. This year's successful nests follow the unlikely disappearance of five breeding male Hen Harriers, which resulted in the failure of their nests.' (The full details are here). But in 2016, numbers fell back to only three successful nests in England from four breeding pairs; and in 2017, three successful nests, all in Northumberland, from a total of seven attempts, produced 10 fledged young. Read more here. Thankfully, though, hen harriers fared a lot better in 2018. Cathleen Thomas on the RSPB Community blog reported three successful nests and 11 chicks fledging in Northumberland, three successful nests on United Utilities land managed for grouse shooting in the Forest of Bowland and one successful nest in the Peak District on land managed for grouse shooting and owned by the National Trust. Cathleen commented; 'This is fantastic news and shows what can be achieved when grouse moors are managed sustainably and legally. Through partnership working with the estate staff, gamekeepers and local raptor workers, we were able to monitor and protect these nests too'. And the 2018 news doesn't end there, for Natural England reported two additional successful nests in England: one on a hill farm and another one on a National Nature Reserve. This gives a total of nine successful nests out of 14 attempts, fledging 34 chicks. Unfortunately, however, five attempts failed. Cathleen further commented: 'However, whilst it's great to see a small increase in numbers, we must continue with our conservation efforts as we're still a long way from where we should be, with the government's own study showing we have enough habitat for 300 nests in England.' All the details are here. (It will be interesting to see whether the 2018 breeding successes result in the presence of higher numbers of over-wintering New Forest Hen Harriers after a virtual no show during the winter of 2017 / 18). The Department for Environment, Food and Rural Affairs' (Defra) response in 2018 to the hen harrier population crisis includes the introduction of what has been described as a 'brood management scheme' designed to boost hen harrier numbers whilst at the same time placating owners of grouse moors and thereby, hopefully, halting illegal persecution. Rather than enforce the law to prevent, or at least reduce, harrier persecution, under the terms of this scheme, licenses will be issued by Natural England enabling the removal from nests of hen harrier chicks and / or eggs. Following hand-rearing in captivity, the resultant birds will be re-introduced back into the wild, presumably in areas away from the grouse moors from which they were taken. Perhaps not surprisingly, the RSPB and other wildlife conservationists have voiced their concerns, as reported here using the very appropriate headline 'Toothless Natural England gives in to wildlife criminals '. Yet as a positive, at least the plight of the Hen Harrier is receiving much needed recognition, including during Hen Harrier Day / Weekend / Week, an annual series of events initiated by Birders Against Wildlife Crime (BAWC). Details of 2018 events are here. But anyway, as autumnal weather closes in, food supplies dwindle and the hen harriers move in search of more hospitable winter quarters, seeking out places that offer both safety and the prospect of easier, more productive hunting. Incoming hen harriers usually start to arrive in the New Forest in late-September, but more usually they are seen from October. Most depart by mid-April. Numbers visiting the New Forest in recent years - already low - have declined further, perhaps reflecting falling numbers of English breeding birds and possibly also as a result of increased disturbance by people and dogs. 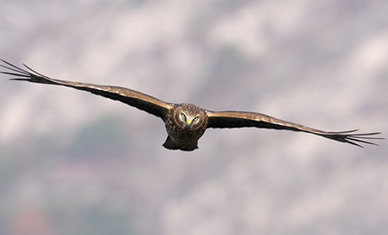 Slim and noticeably long-winged, female hen harriers have a wingspan of up to 118 centimeters (almost 4 feet), and a body length of 55 centimeters (almost 2 feet), whilst males are slightly smaller. Females and first year hen harrier males have somewhat nondescript, dark brown plumage with a distinctive pale rump that gives them the often used name ‘ring-tail’. Mature males, once fittingly known as blue hawks, are primarily pale, blue-grey in colour, neatly rounded off with blackened wing tips. On the Crown Lands of the New Forest, even at a distance, it’s hard to confuse hen harriers with any other bird, except maybe in April when the extremely rare Montagu’s harrier may also occasionally be present. Hunting behaviour is distinctive. Using flapping, buoyant flight they quarter the ground, keen-eyed, alert, looking for signs of life below, and in the worst of weather, flying into the wind, cleverly using the currents to help keep aloft. Determined to let nothing escape their attention, hen harriers often repeatedly over-fly the same patch of ground before moving on to try again elsewhere. Success rates are probably quite low, but by hunting over extensive areas, hen harriers generally seem to find enough food upon which to eke out at least a meagre living. Somewhat incongruously for such fierce, seemingly independent creatures, hen harrier night-time roosts are communal affairs down on the ground amongst rank vegetation. At dusk, New Forest hen harriers and also some that spend the day hunting farther afield, gather in a small number of traditionally used roost sites, flapping in over the heaths before plunging down out of sight to rest in the company of others. In recent years, roost site disturbance has been something of a problem, caused at times by careless dog walkers, but more often, sad to say, the fault of over-enthusiastic bird watchers anxious to view these stunning birds.